Some people assume that sustainability and efficiency require sacrifice. In other words, using less means going without. However, energy and resource savings, and sacrifice don’t belong in the same sentence. (Unless that sentence is, “Energy and resource savings have nothing to do with sacrifice.”) It’s a point underscored by our work with Hilton Worldwide. Hilton is one of the largest and best-known hotel chains in the world. And it’s earned that distinction by providing a world-class guest experience. Across more than 100 countries and territories, and a diverse portfolio of brands, quality and comfort are the common threads. At the same time, managing such a significant operation comes with significant overhead. So Hilton is constantly seeking new opportunities to reduce costs, but never at the expense of its guests. Plus, the company’s strong commitment to sustainability has led it to implement ambitious energy- and water-efficiency goals. Hilton felt it wasn’t possible to address all three challenges — enhancing efficiency, fulfilling sustainability commitments and improving the guest experience — on its own, all at once. What the management team needed was the expertise of a global energy and sustainability specialist. That’s how Hilton and Schneider Electric came together. A close look at Hilton’s operating expenses show that labor is the largest outlay, not surprising given the importance of the human touch in providing a memorable guest experience. Next on the list, however, are utility bills. The company spends almost 5 percent of annual revenue on energy and water. That equates to hundreds of millions in costs each and every year. To help reduce these expenses, Schneider Electric’s Energy and Sustainability Services team presented some interesting options. The solution tailored for Hilton started with Resource Advisor, a scalable, cloud-based software application that makes near-real-time utility pricing and consumption data visible, comparable and actionable across Hilton’s global portfolio of owned, managed and leased properties. At the enterprise level, it allows managers to configure personal dashboards and generate customized reports for water, waste and electricity use — to analyze performance and benchmark facilities across geographies. But measurement is a means to an end. Using the data to efficiently manage resources is the ultimate goal. So Schneider consultants helped put Hilton’s energy data to work, using it to drive pricing negotiations with utility suppliers, to identify energy-saving opportunities and to advise on equipment maintenance. In addition, automated billing management completes the procurement cycle to ensure timely payment while minimizing pricing discrepancies. On-site, Schneider Electric building management solutions help staff optimize resource consumption, and combine facility control systems with comprehensive utility cost transparency and flexibility. Energy University, a professional education curriculum focused on resource efficiency, allows managers and facilities staff to add new skills and adopt best practices. 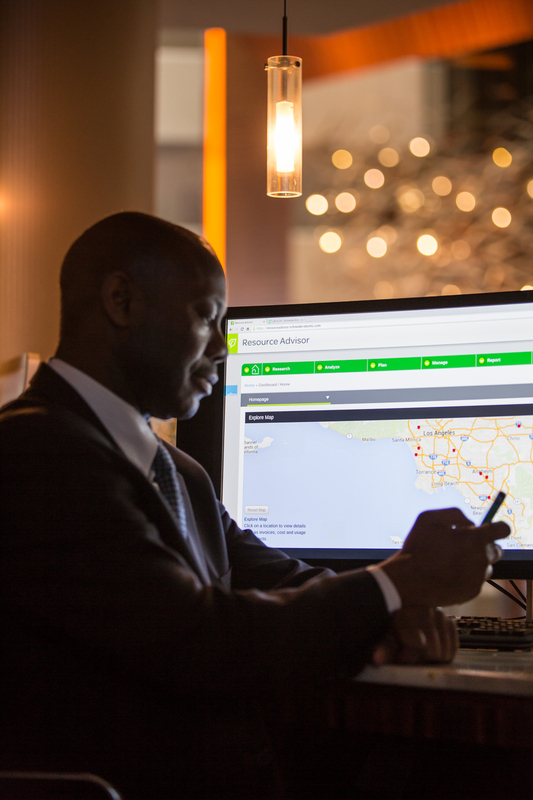 Schneider Electric expertise extends even to Hilton’s guest rooms, where travelers can personalize their room temperature, lighting and other settings. The technology also helps prevent security threats and detect smoke from fires early. The Schneider Electric team continues to support Hilton’s strategic energy plans and policies with innovation every level — from macro efforts to reduce energy and water use, operational expenses, and environmental impact, to helping improve the experience of every guest who walk through the doors. The energy savings achieved by Hilton are appreciated by its management, but also by a growing number of eco-minded visitors. Moreover, these savings, amounting to around 3 percent per year (and 14.5 percent since 2009), allow Hilton to reinvest more into its guests, as well as its sustainability programs. More for less, the ultimate combination. This is the first in a series about Schneider Electric clients that are setting the standard for sustainable business. For future stories, and more energy and sustainability perspectives, follow us on Twitter and LinkedIn.